Hope you enjoy the nice weather we have these days in Sapporo, spring is here at last ! It reminds me of the first song I learned in Japanese : 春が来た, in English ''spring has come''... I guess in Hokkaido, spring is really a blessing. (No, it's NOT snow as the advertisers claim). I am looking forward cherry but also, magnolia blossom, my favorite flower. But, I really dread the avalanche of sakura-taste treats such as donuts, drinks, curry and even hamburger...stop the massacre, just watch the flowers, don't eat it. And you, what is the most surprising sakura-taste food you ever seen (and dared to try) ? 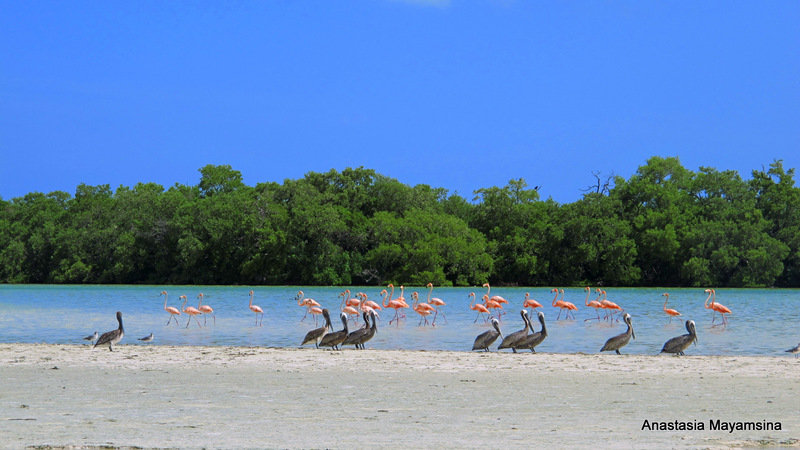 One of brightest memories of my latest traveling adventures - crossing Central America from Panama up north to Mexico - is how I encountered my first flamingoes. at the tip of Yukatan peninsula in Mexico. Long and narrow strip of land is surrounded by torquoise waters of Caribbean sea. Holbox is one of the rear places where you can watch whale sharks, as well as mantras, reef sharks and other sea creatures. The island is a tropical paradise, with neither engine cars, nor paved roads, but amazing white sand and palm trees all around, lots of birds, sea shells and friendly locals. And if you can tolerate abundance of mosquitos, you are all set for a perfect hide away vacations or sweet escape into nature. Walking by the beach one sunny afternoon I met couple of friendly local guides, seeping beer in hammocks, in the shade of a palm tree. Almost everybody in Mexico speaks only Spanish, but by 4th month in Central America I could easily communicate on the surface level of everyday topics. I asked them where I can see flamingoes on the island? 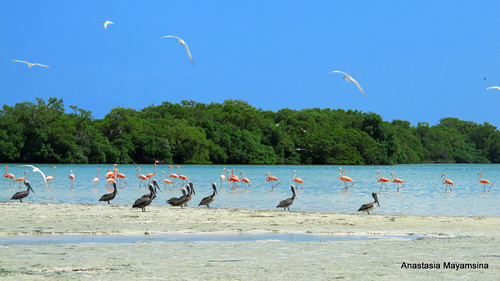 So many travel agencies advertise flamingoes watching trips, and I wanted to get more information. And those guys told me that there is no need to buy a birds watching half-day tour if you just want to see flamingoes. All you have to do is to go by the beach and eventually you will reach them. I was really puzzled! - Really? Just walk towards that side? All the way? 30 min only? They are so close to us, I can't believe it! My Spanish is not so good, to understand why it was so important. I thought that the birds fly away by the afternoon. Doesn't really matter. I was so surprised, so overwhelmed. For me it sounded like a great adventure, I even felt tingling sensation in my nose, that's how excited I was! So, I rushed back to my boy-friend to tell him everything that I had just learned. We decided to go and explore the flamingoes area the next morning. We started early. Rubbed ourselves with lots of antireppelent and sunscreen and went on self guided tour to find flamingoes. We walked all the way down by the sea shore to a river which we had to cross in it's delta. Even though we met some of the tourist walking the same way by the beach, it looked like nobody reached this point. In my sense of adventures crossing river was fun. The current was rather strong and my boy-friend had to put his backpack on top of his head and I was holding my camera up in the air. pelicans, herons - great rookery, desolate, with no humans around. It was so beautiful, pink flamingoes on long and thin legs, so elegant and gracious. After the first minutes of excitement my partner decided to get closer and started walking towards the birds. As soon as the birds noticed his tall figure, the closest to us got scared and flew away. I thought for a moment and came up with an idea that we should crawl not to shoo them away. And as we crawled on our fours slowly and patiently we managed to get closer to them. The reward was amazing - we could watch the birds in their natural habitat, acting naturally. We settled down in muddy salty waters about 30 meters away from the rookery to watch the bird's life. I learnt a lot about them right there during our first meeting. I could see how social they were, how argumentative and quarrelsome with each other. 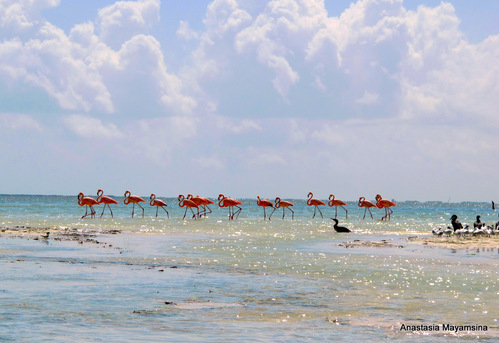 It's an amazing experience to watch flamingoes, they are not just beautiful birds, but they have their own, notable behavior. And then they searched for krill dipping their small heads with big beaks in the mud. When the head goes all the way into the mud, so on the surface there is only a neck, that looks pretty unrealistic from human point of view. Then I noticed that a school of young flamingoes stays separately from the adults. With one tutor. Just like kids in the kindergarten... I felt like a real ornithologist. 2 hours had passed like 20 minutes! In spite of thousands of mosquitoes, attacking us on the way and blasting sun, it was an amazing day, one of the best experiences in Central America. And the best of all was the sense of achievement, that we found this place by ourselves, that we were active explorers, not passive watchers on a tour, we were our own tour guides and all that makes a great difference! 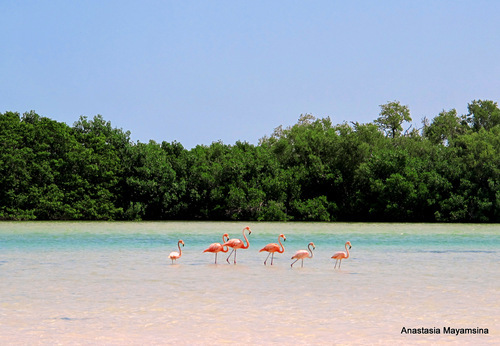 So I wish everybody to do it, to go and meet their first flamingoes in life by finding them themselves.